Does Face to Face Selling Still Work in a Digital World? chuckholmes April 18, 2017	 Leave a Comment on Does Face to Face Selling Still Work in a Digital World? Does face to face selling still work? Someone sent me an email yesterday asking me that question. I’ve been thinking about it ever since, and I figured it would make a great blog post. 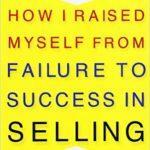 To answer the question: YES, faceContinue reading… Does Face to Face Selling Still Work in a Digital World?